Uh oh! Potentially sad news for kebab lovers in kebab-capital of Europe, Berlin. The price of the Turkish delight may be heading up due to increases in food prices. Though the article says prices hover around 2.5 euros in the German capital, I don’t remember paying so little when I was there this past March. But the Berlin-babs were certainly cheaper than in Munich or Hamburg. 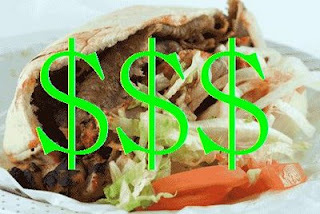 Whatever, all German doners are still cheaper than in Paris, where they usually average around 5 euros. But Parisians do add fries – take that Germany!